Sophomore Michelle Woods (10) brushes past Boston College players during the team’s afternoon game on Sunday. The Canes won 79-54 to improve to 17-8. After a tough loss to Florida State last week, the Hurricanes were able to redeem themselves Sunday afternoon, winning a physical home game against Boston College 79-54 to move to 17-8 (8-6 ACC). The Canes first drew blood with a Suriya McGuire jumper, but would soon find themselves in a closely contested dogfight with the visiting Eagles. 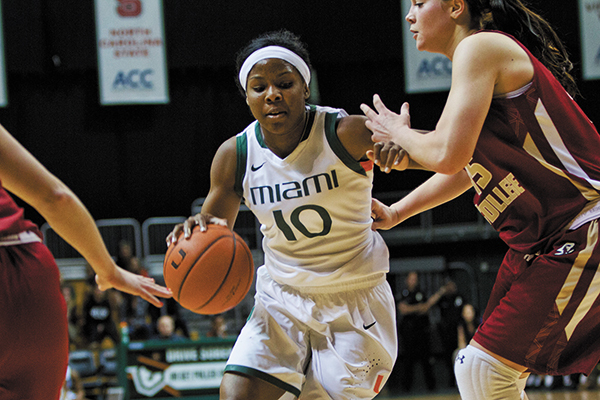 With the score at 27-25 with less than five minutes to go in the first half, Miami was able to pull away. The Hurricanes used a 13-4 run to close out the half. The second half showed more of the same, as the Canes continued firing on all cylinders to bump up their lead to 27 with about nine minutes to play. The Hurricanes were able to impose their will offensively, tying their regular-season best with 79 points scored. It was also the first time since Dec. 20 against N.C. State that the Canes had five players in double digits. One of them was Shawnice “Pepper” Wilson, who scored a game-high 17 points (tied with Morgan Stroman) and grabbed nine rebounds. With the win, the Canes have now put themselves into position to finish the season strong and make a push for the NCAA Tournament. ESPN currently has them ranked as an 11 seed, but with strong showings on the road against N.C. State, Georgia Tech and Virginia Tech, the Canes could climb to an even higher seed. Miami has a final chance to impress the selection committee when Duke visits the BankUnited Center on Feb. 28. It will also mark the last time the seniors play on their home court. Saunders is determined to make it a game they will remember.